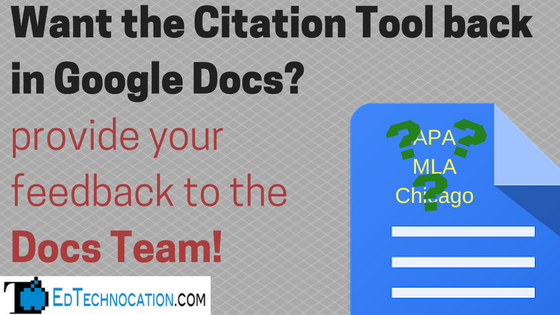 EdTechnocation: Give Official Google Docs Team Feedback on the Missing Citation Tool! Give Official Google Docs Team Feedback on the Missing Citation Tool! I recently posted about the missing Citation tool in the new Explore for Google Docs and shared some alternative options (see How to Create Citations without the Research Tool). I also shared a way to let the Docs Team know your disappointment over the missing Citation Tool. The Docs Team was listening and they want more feedback! Read on to learn how you can participate in an official Google Docs Team feedback survey. The Google Docs Team has heard our cries and are looking for more feedback on how teachers and students used the Citation Tool in the previous Research Tool and how you might use it in the new Explore. Fill out the official form below. 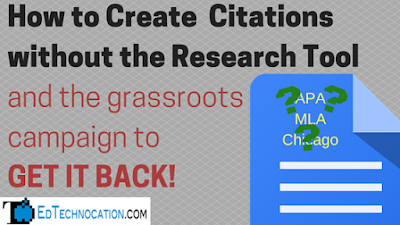 Click here for add-ons & Chrome extensions to help create citations!